It has been a good couple of months now since I first stepped foot onto my allotment. It was a bare patch of rotovated soil that gave me a blank canvas upon which to start my journey into food production on a grander scale. The plot is on a fairly secluded site surrounded by high hedges about half a mile from the runway at Luton Airport. 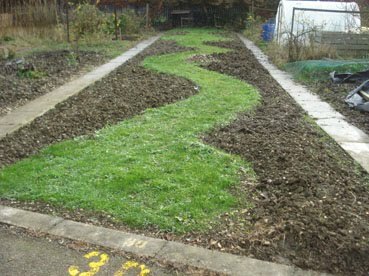 With no real idea what had been on the plot before hand, nor any idea what the soil was like there, my main initial task was to lay out a path up the middle. This was easy as it just involved marking a pleasing curvy path and throwing down some grass seed. Then came the digging by hand. This was my only way of really getting a feel for what the earth was like. When I first started in September, the soil was dry, very hard, full of flints and impossible to dig with a spade. There had been no rain for many weeks and the spade was soon abandoned in favour of a garden fork. Over the past couple of months the plot has now been dug and I completed the task a couple of days ago after a spell of rather wet weather. The contrast in digging conditions from when I first started was amazing. In parts soil was completely waterlogged with standing water at the bottom of the trench and almost impossible to do anything with. All I could do was just loosen the earth and let a bit of air in. Now that the earth has all been turned I can let the winter do its weathering job and I should be ready to plant in the spring. The soil seems very lacking in organic matter and what with all the stones and flints present will probably dry out quickly. I did start to remove quite a lot of the stones I found and quickly managed to build quite a large pile, but there were so many that I then began to only remove the biggest ones that my fork hit. At least I've got some air into the soil and found a few worms - though not that many. A mole has even dug a tunnel under my path - I don't get them in the house garden at all. I keep hearing people say how time consuming allotments can be. I hope to prove them wrong by careful planning of low maintenance crops and efficient weed management. I've already got a small and very cheap push mower to cut the path, and I think that a good quality hoe will keep down many of the weeds - as well as intensive planting of a wide variety of crops. I am mainly planning to grow root crops, though the stoney nature of the ground will be a problem. I don't want to grow things that require a lot of regular watering, spraying against caterpillars or protection from slugs. I gather that pigeons are a problem on the site so I may have to invest in some wire netting for young plants. With the dark winter evenings ahead of me I'll have to sit down and do a bit of research to find out how best to utilise the plot. I am surprised at how little composting goes on in neighboring plots. A huge amount of topsoil and organic matter is just piled up with other rubbish to be taken away by the council on a regular basis. I'm am quite amazed at this and will probably go and remove some of it to start my own compost heap so that I'll have something to add to my soil in the spring. The topsoil seems very thin on my plot and the last thing I want to do is remove anything from the site! I know that I'll remove vegetables, but any other organic matter that the system produces must be recycled back into it to help improve soil quality and fertility. About two-thirds the way up the plot I've created a large circular patch of grass. Turning some of the plot into lawn is probably cheating a bit in the sense in that it is reducing the area in which I need to do much, but I wanted to create a space in which to sit, have picnics or become a play area for my daughter. In fact, when I look at the photo it does seem as though there isn't much space that isn't path, but I am sure the perspective is deceiving as there was a lot of digging involved! I'll probably be narrowing the path anyway in the spring when the soil has settled down a little. I'm not really planning to blog much about the allotment unless there is something significant to say. This is really just a summary what i've done so far.